The reported SoC temperatures 'measured' in the second run with the short cable are way too low. So the steps outlined here may provide some graphs regarding the internal SoC's thermal sensor. But currently I have no idea how the formula has to be adjusted to report reliable temperature values from the SoC. Since I didn't had any USB power consumers in the above setup I tried it with an older Apple USB keyboard and an optical mouse. I shut the Banana Pi down on 11:26 and tried to start it with the long power cable and both keyboard/mouse attached. The Banana Pi refused to boot and immediately shut down after a few seconds (I then remembered that sudden shutdowns happened also in the past when I plugged in the keyboard and mouse simultaneously while Banana Pi was running). Prior to attaching both USB devices idle consumption (11:00-11:25) was in the range of 300mA. With USB devices attached 150mA above with peaks even exceeding the max. consumption while doing the stress test without USB peripherals (11:43-11:58). Between 11:41 and 11:56 I repeated the stress test while USB stuff plugged in. 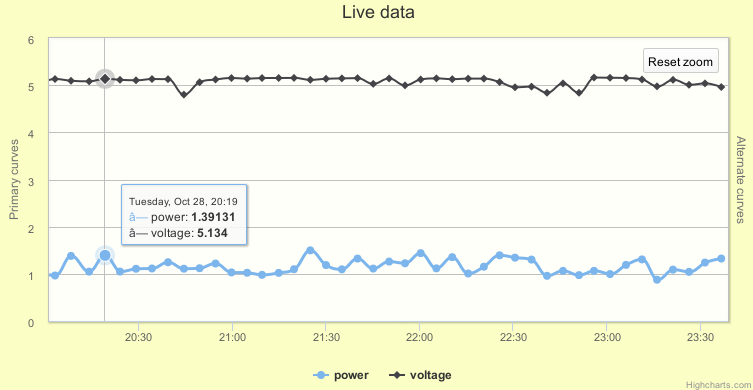 In this scenario the voltage dropped below 4.9V. I'm on way to build some probes to monitor temperature and humidity around my house, and I thought to use the +5V from CON3 or J12. My idea wasn't to discourage the use of the Banana Pi (so far it's the fastest ARM based 'server' I ever touched -- and the most inexpensive too) but to get other readers to jump in and measure also some stuff. Installation of RPi-Monitor is really straightforward and done in minutes following this tutorial step by step: http://rpi-experiences.blogspot.fr/p/rpi-monitor-installation.html. I didn't face any powering issue : I have a "green" (low consumption) 2TB Sata disk powered and been able even to rebuild GCC which took several hours to compile with high CPU and disk usage. Now if I want to dispatch several 1wire probe in my home, the problem you reported has to be tracked and potentially, I'll have to find an better way to provide power : I will try to power it up from an ATX psu, with a 3.5'' harddrive and power the PI from it's sata, as Tony suggested. The other strange thing in my case is the the voltage "drop" seems unrelated with CPU consumption ... so I guess I own a good USB cable but the PSU is not as stable as it is supposed to be. OR it's the voltage probe that is not accurate. My next test with the Banana Pi + 3.5" SATA disk will be with a Voltek SPEC7188B (5V/3.7A, 12V/0.7A) and I have a couple of old PATA-HDD enclosures (both USB and Firewire) with external fanless PSUs capable of 5V/2A and 12V/2A which make them the perfect companion for Pi+HDD in such a scenario. If you use the link above and zoom into the temperature graphs you will notice that the SoC's temperature dropped by 4 degrees around 13:36 and by 2 degrees around 13:45 since I touched the A20 with one of my fingers for approx. 30 seconds. Unlike the Banana Pi the Olimex board has no heatsinks attached now so that this sort of tests (which chip's thermal sensor do I really measure? A20 or AXP209?) do work. Out of curiosity, I just ran a quick comparison. I think your right about the cable and connector quality, but maybe it's not a length issue. I happen to have ordered my BPi from the same seller, so I also got the Quatpower PSU (which I'm not using atm since it's not working reliable) and a cable that came with it. I never unpacked the cable actually, because I had a spare one which is slightly longer. Anyway, for the test, I unpacked the cable and compared it to the longer one I already had (came with a Logitech device). When I use the Logitech USB cable, the voltage during idle is is around 4.95V. When I replace the Logitech cable with the cable that came with the Quatpower PSU, then the voltage during idle is 4.75V. So there is a noticable difference, but in my case it is not due to cable length. In both cases I used a 5V/2A power supply from Asus (came with a tablet computer). I did some test with a PC I'll cannibalize, and its PSU power on at least with my Green hard drive attached. It will be good for testing purposes, for my "production server", I need first to check the wast the PSU creates. So with an external power supply, right ? The Banana only provides 5v ... and I'm worrying for the D5 if your disk consume so much. And as I said, I have voltage drops totally unrelated to CPU load. When I use the Logitech USB cable, the voltage during idle is is around 4.95V. When I replace the Logitech cable with the cable that came with the Quatpower PSU, then the voltage during idle is 4.75V. What about the overall consumption of your Banana Pi? IIRC you have a busy USB disk attached?